A coordinating conjunction joins words, phrases, or clauses of equal importance or emphasis. The seven coordinating conjunctions are easily remembered by the acronym, FANBOYS (For-And-Nor-But-Or-Yet-So). Examples: Jack and Jill; thinking quickly; but acting slowly; She left her job early, so she would be able to clean the house before the guests arrived. An independent clause (a subject and predicate expressing a complete thought) must follow the beginning coordinating conjunction. Don’t begin too many sentences in an essay with coordinating conjunctions. Sentence variety is important, so don’t overuse the same sentence structure. Write the following sentences and [bracket] the conjunctions. Byron and Jake were late, not Pedro or Tamara. Misty, my calico cat, loves to be petted, but hates to be scratched. Mandy hates the smell of cotton candy yet loves the taste and texture. Pedro refuses to sleep in the tent, nor will he sleep outside under the stars. The Larsens stopped skiing and snowboarding, for these sports cost too much and take up so much of their leisure time. Re-write the sentence to eliminate the fragment. But do not start a sentence with a coordinating conjunction unless you finish it. Byron [and] Jake were late, not Pedro [or] Tamara. Misty, my calico cat, loves to be petted, [but] hates to be scratched. Mandy hates the smell of cotton candy [yet] loves the taste and texture. Pedro refuses to sleep in the tent, [nor] will he sleep outside under the stars. The Larsens stopped skiing [and] snowboarding, [for] these sports cost too much [and] take up so much of their leisure time. Well-meaning teachers borrowed a well-used copy of Daily Oral Language activities from another teacher years ago and have faithfully used the same lessons as “openers” ever since. The advantage of such “programs” is that they require no teacher preparation. Unfortunately, these collections of grammar and mechanics mistakes provide no diagnostic information, have few teaching resources, and fail to establish a sensible instructional scope and sequence. Students simply rehearse errors. This ineffective practice rarely translates to mastery learning. Learning grammar and mechanics out of the context of meaningful writing may help students get a few questions correct on the standardized test, but this knowledge just won’t transfer to their writing. As a middle and high school ELA teacher, I’ve always favored a balanced approach to teaching grammar, usage, and mechanics in the context of reading, writing, listening, and speaking. Like many veteran teachers I’ve found that openers, daily edits, and mini-lesson approaches rarely produced student retention and simply did not show up in student writing and speaking. With the advent of the Common Core State Standards, I welcomed the death knell of these approaches and found the specifics of the grade-level Language Standards, coupled with the Progressive Skills Review, a more realistic and productive approach to instruction. I’ve always believed in the dual role of teachers to help students keep up with rigorous grade-level instruction, while they catch up with content and skill deficits through individualized assessment-based instruction. Teachers do favor different instructional approaches, and a variety of methods are certainly useful. I’ve written and taught the grades 4–high school Teaching Grammar and Mechanics with interactive lectures, practice and error analysis, simple sentence diagrams, mentor texts with writing applications, formative assessments, and bi-weekly unit tests. I’ve also found value in the interactive notebook approach, authoring and piloting the grades 4–8 Teaching Grammar and Mechanics Interactive Notebooks. Additionally, my approach to both grade-level and remedial instruction works especially well with my Academic and Remedial Grammar, Usage, and Mechanics Literacy Centers. Having recently reviewed the following articles (over 60 at last count) and their accompanying FREE resources and lessons, I’m excited to share with you a teacher’s experience, opinions, research, and trial and error discoveries of what works to help students learn the fundamentals of our English language. Most teachers are familiar with Daily Oral Language, abbreviated as D.O.L. or under the guise of similar acronyms. Teachers like the canned program because it requires no teacher preparation, it provides “bell ringer” busy work so teachers can take attendance, and it seemingly “covers” the subjects of grammar, punctuation, capitalization, and spelling. D.O.L. is probably the most popular instructional technique used to teach grammar. The second most often used technique would be the “teach no grammar-nor-mechanics technique” as is frequently employed by writing process purists who save this “instruction” until the last step of a process piece, if they ever get to it at all. However, the subject of this article is the latter technique, and why D.O.L. does not work. The Teaching Grammar and Mechanics Interactive Notebook Grades 4−8 programs will help your students master each of the Common Core grade-level grammar and mechanics Standards. This rigorous, fun, and easy-to-teach interactive notebook is neither a fact-filled collection of boring lecture notes, nor a time-wasting portfolio of art projects. Evan-More’s Daily Editing is certainly an improvement over the publisher’s Daily Language Review or the popular Daily Oral Language (from many different publishers). The instructional scope and sequence of Daily Paragraph Editing is aligned to the Common Core State Standards and most other state Standards in grammar, usage, and mechanics. However, editing in the context of a paragraph does not solve the issue of teaching skills in isolation. Requiring a student to write a similar article is not the same as requiring students to apply specific skills learned in a lesson in the context of their own writing. If you google “grammar worksheets,” you get 2,970,000 hits; if you google “vocabulary worksheets,” you get 8,250,000. Clearly more teachers other than Mr. Worksheet like their worksheets and see the value of deliberate, targeted, independent practice. Thought I’d dig into the educational research a bit to see whether what teachers say or what teachers do makes more sense. Not all worksheets are created alike. Worksheets need not “drill and kill” students to boredom or busy-work. Good teachers can spot a good worksheet when they see one. The educational research provides insight as to what makes a grammar, usage, and mechanics worksheet an effective instructional strategy for knowledge and/or skills acquisition. Check out the research-based grammar worksheets in this article. However, most all teachers support teaching some form of simple to complex instructional order in teaching mechanics. For example, students need to be able to define, identify, and apply simple abbreviations (Mr.) before learning acronyms (UNICEF) and initialisms (FBI). In other words, the simple academic language and mechanics instruction should precede the more complex. We have supportive (and recent–as of January 2016) educational research to validate this instructional order. Check out the grades 4-8 mechanics instructional sequence aligned to the Common Core State Standards. The TGM Grammar Diagnostic Assessment tests all of the basic grammar, parts of speech, and usage skills in an efficient multiple choice format. Students complete the assessment in 15-20 minutes. Record the data on the TGM Grammar Mastery Matrix and differentiate instruction according to student needs. Note: the Teaching Grammar and Mechanicscurriculum provides worksheets with formative assessments that correspond with each item on this assessment. The TGM Mechanics Diagnostic Assessment is a whole class assessment that tests all of the basic punctuation and capitalization skills. Students complete the assessment in 10-15 minutes. Record the data on the TGM Mechanics Mastery Matrix and differentiate instruction according to student needs. Note: the Teaching Grammar and Mechanics curriculum provides worksheets with formative assessments that correspond with each item on this assessment. The old Schoolhouse Rock song poses the question: “Conjunction junction, what’s your function?” A clever rhyme, but the rest of the lyric provides little help to answer the question. Here’s the answer with some memory tricks to help your students remember and use the three types of conjunctions to add sentence variety to their writing. For those of you primary teachers wondering how to teach the rigorous grammar, usage, mechanics, spelling, and vocabulary Standards… you are not alone. Check out how the sentence building exercises using sentence diagramming can make a difference for primary students. “How to Teach Writing Mechanics” asks and provides possible answers to the What is (and isn’t) Writing Mechanics, Why Teach Writing Mechanics? When Should We Teach Writing Mechanics? What Writing Mechanics Should We Teach? How Should We Teach Writing Mechanics? How Much Class Time for Writing Mechanics? questions related to teaching the nuts and bolts of punctuation, capitalization, formatting, citations, quotations, etc. Check out and download the entire grades 4-8 mechanics instructional scope and sequence (completely aligned to the Common Core Language Strand Standards. “How to Teach English Grammar” asks and provides possible answers to the most pressing When, Why, How, What, and Whom questions related to teaching grammar. Check out and download the entire grades 4-8 grammar instructional scope and sequence (completely aligned to the Common Core Language Strand Standards. 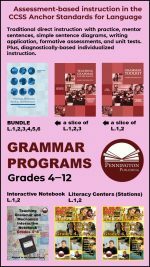 Teachers frequently ask which Pennington Publishing grammar program will best meet the needs of their students. Of course most of us use grammar as a catch all term to mean parts of speech, syntax, usage, sentence structure, subjects and predicates, punctuation, quotation marks, and capitalization. For those teachers using the Common Core Standards, they are looking for materials to teach the Language Strand 1, 2, and 3 Standards. 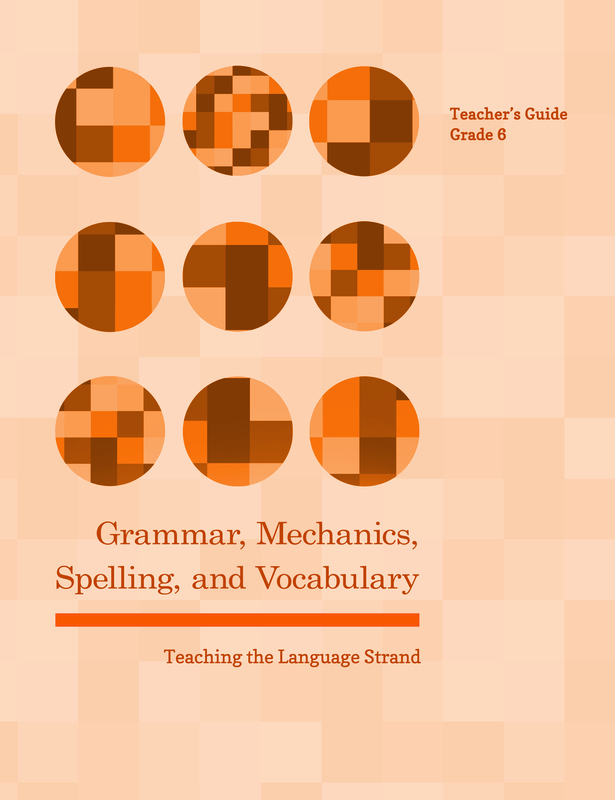 Grammar, Mechanics, Spelling, and Vocabulary (Teaching the Language Strand) is part of a comprehensive Grades 4-12 language program, designed to address each Standard in the Language Strand of the Common Core State Standards in 60-90 weekly instructional minutes. 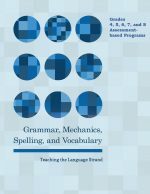 This full-year curriculum provides interactive grammar, usage, mechanics, and spelling lessons, a complete spelling patterns program, language application openers, and vocabulary instruction. The program has all the resources to meet the needs of diverse learners. Diagnostic assessments provide the data to enable teachers to individualize instruction with targeted worksheets, each with a formative assessment. Progress monitoring matrices allow teachers to track student progress. Each instructional resource is carefully designed to minimize teacher preparation, correction, and paperwork. Appendices have extensive instructional resources, including the Pennington Manual of Style and downloadable essay-comments. A student workbook accompanies this program. English-language arts teachers have long been accustomed to the four-fold division of our “content” area into Reading, Writing, Listening, and Speaking. These divisions have been widely accepted and promoted by the NCTE, publishers, and other organizations. In a nod to the fearsome foursome, the Common Core State Standards in English Language Arts maintains these divisions (now called strands)with two notable revisions: Speaking and Listening are combined and Language now has its own seat at the table. So who exactly is this new dinner guest? For those just beginning to explore the CCSS Language Strand, an overview may be helpful. The Language Strand has been one of the most controversial components of the COMMON CORE STATE STANDARDS FOR ENGLISH LANGUAGE ARTS & LITERACY IN HISTORY/SOCIAL STUDIES, SCIENCE, AND TECHNICAL SUBJECTS. One of these components stirring up heated debate has been the Language Progressive Skills document. English teachers learn early in their careers that strong nouns and “show-me” verbs are the keys to good writing. Of these two keys, verbs give developing writers the most “bang for their buck” in terms of writing revision. As a plus, revising weak and imprecise verbs, such as helping verbs (also known as auxiliary verbs), with active “show-me verbs” is quite teachable and less vocabulary-dependent than working with nouns. Learn when to use and when not to use helping verbs and how to eliminate them to improve writing. Psychologists and educational theorists have developed learning theories to explain how new learning and skills are most efficiently mastered and best transfer to other academic activities. Let’s examine the most influential of these learning theories to explain why D.O.L. does not transfer to writing. Daily Oral Language is built upon oral review. Lack of instructional depth and the methodology of oral practice are key reasons why teachers complain that students do not retain the skills reviewed in Daily Oral Language (D.O.L.). After all, the reason we bother teaching mechanics, spelling, and grammar is to help students improve their writing. A balanced approach to grammatical instruction just makes the best sense of the grammar research. 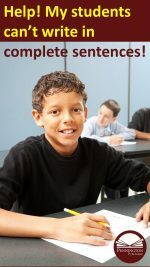 An approach that involves direct grammatical instruction in partnership with plenty of connected reading (sentence modeling) and writing (sentence manipulation). Here’s the summary of grammar research and practical instructional implications for teachers committed to differentiated instruction. Teachers de-emphasize grammar instruction for six key reasons. Learn these reasons and re-prioritize your instruction to include teaching grammar in the context of meaningful writing. Within the field of English-language arts, there is probably no more contentious curricular issue than that of how to teach grammar. The “Reading Wars” and “Writing Wars” get all the press, but teachers are much more unified in their teaching philosophy and instructional practice in those areas than they are with grammar. Here are 21 assumptions about grammatical instruction and four simple steps to teach grammar, mechanics, and spelling to your students. The Great Grammar Debate between those favoring part to whole and those favoring whole to part grammar instruction is still relevant. Balanced grammar instruction includes four components: 1. Differentiated instruction based upon diagnostic assessments 2. Direct instruction in grammar and mechanics 3. Writing strategies practice and 4. Writing process revision and editing. The complete sentence is, undoubtedly, the most important benchmark of conventional writing. Subjects and predicates are the best identifiers of the complete sentence and the best checks to identify sentence fragments and run-ons. This article helps students to identify sentence subjects and predicates with clear definitions and examples. Writing in complete sentences is the essential writing skill. Even sophisticated writers sometimes struggle with sentence fragments. 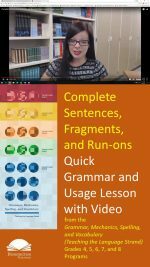 Learn how to identify sentence fragments in your own writing and, more importantly, fix these to create mature and complete sentences. Writing in complete sentences is the essential writing skill. Even sophisticated writers sometimes struggle with run-on sentences. Learn how to identify run-ons in your own writing and, more importantly, fix these to create mature and complete sentences. Perhaps no instructional issue in English-language arts produces more contentious debate than the issue of how best to teach grammar. All too often we bog down in our discussion over the issue of instructional strategies. Perhaps a more useful starting point for our discussion would be to come to consensus about what we expect students to know and when. Establishing a common ground on this issue can help us determine what to diagnostically assess in order to determine our students’ relative strengths and weaknesses. Here is the list of the Top 40 Grammar Pet Peeves that irritate most Americans. Learn what’s wrong, what’s write, and the tips to avoid these common grammatical mistakes. Students love to rap with the parts of speech. The key definitions are included in concise form. An MP3 file makes it easy to teach and learn. Knowing the parts of speech is key to the grammatical language of instruction. Writers need to be able to accurately identify and apply each of these ten parts of speech. This concise reference clearly defines all ten parts of speech and provides clear examples of each. Proper punctuation and capitalization are marks of an educated and careful writer. Here is everything you need to know about proper punctuation and capitalization in one concise reference. Clear examples make this tool a must for every writer. Time to ditch ineffective Daily Oral Language (DOL)! Learn an instructional approach that teaches adverbs in the context of writing and reading. Review an instructional scope and sequence for teaching verbs that makes sense. Get all the definitions, examples, and writing style resources for how to teach verbs in easy-to-understand language. And check out the cool verbs cartoon. Time to ditch ineffective Daily Oral Language (DOL)! Learn an instructional approach that teaches adjectives in the context of writing and reading. Review an instructional scope and sequence for teaching adjectives from primary elementary to high school. Get all the definitions, examples, and writing style resources re: how to teach adjectives in easy-to-understand language. And check out the cool adjectives cartoon. Time to ditch ineffective Daily Oral Language (DOL)! Learn an instructional approach that teaches pronouns in the context of writing and reading. Review an instructional scope and sequence for teaching pronouns from primary elementary to high school. Get all the pronoun definitions, examples, and writing style resources in easy-to-understand language. And check out the cool pronouns cartoon. Time to ditch ineffective Daily Oral Language (DOL)! Learn an instructional approach that teaches nouns in the context of writing and reading. Review an instructional scope and sequence for teaching nouns from primary elementary to high school. Get all the noun definitions, examples, and writing style resources in easy-to-understand language. And check out the cool nouns cartoon. Time to ditch ineffective Daily Oral Language (DOL)! Learn an instructional approach that teaches adverbs in the context of writing and reading. Review an instructional scope and sequence for teaching adverbs from primary elementary to high school. Most importantly, get adverbial definitions, examples, and writing style resources in easy-to-understand language. And check out the cool adverbs cartoon. “Conjunction junction, what’s your function?” Time to ditch ineffective Daily Oral Language (DOL)! Learn an instructional approach that teaches conjunctions in the context of writing and reading. Get all the conjunction definitions, examples, and writing style resources in easy-to-understand language. And check out the cool conjunctions cartoon. Wouldn’t it make sense to spend instructional time on the part of speech that constitutes 30% of all writing? Prepositional phrases are used that much. Time to ditch ineffective Daily Oral Language (DOL)! Learn an instructional approach that teaches prepositional phrases in the context of writing and reading. Get all the preposition definitions, examples, and writing style resources in easy-to-understand language. And check out the cool prepositions cartoon. See how much you know about mechanics (commas, capitalization, quotation marks, colons, apostrophes, semicolons, punctuation, etc.) 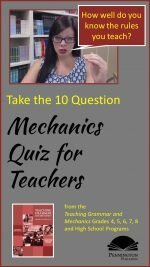 by taking the 10 Question Mechanics Quiz for Teachers. Don’t worry; I’ll dispense with the usual “If you score 9 or 10 out of 10, you are…” Let’s keep things fun! See how much you know about grammar by taking the 10 Question Grammar Quiz for Teachers. Don’t worry; I’ll dispense with the usual “If you score 9 or 10 out of 10, you are…” Let’s keep things fun! Tucked away in the often-overlooked recesses of the Common Core State Standards, the Anchor Standards for Language includes a practical, if somewhat ambiguous Standard: Knowledge of Language L.3. Over the past decade, I’ve noted with interest that the educational community has cherry-picked certain Standards and ignored others. Get free sample lessons from Pennington Publishing’s Writing Openers Language Application (Grades 4, 5, 6, 7, and 8). Literacy centers provide an ideal social context for cooperative learning about grammar: parts of speech, syntax and sentence structure, standard and non-standard usage, word choice, dialect, punctuation, capitalization, etc. Now, of course your students need the right tools. We can’t have the blind leading the blind. 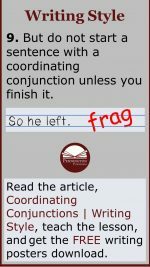 How about a few interactive grammar lessons to test-drive with your students in a cooperative group or literacy center? Your download includes four grammar and mechanics lessons, the unit test (with answers), directions, and literacy center leadership roles. How about a few interactive grammar lessons to test-drive with your students? Your download includes four grammar and mechanics lessons, the unit test (with answers), directions, and literacy center leadership roles. I’ve noticed a new and developing interest in writing style and I don’t think it’s a nostalgic homage to Strunk and White’s The Elements of Style. Indeed, our collective writing craft has diminished over the years, but when I see twenty-something teachers driving a return to grammar handbooks and style manuals I see more than a glimpse of hope. Pennington Publishing’s The Pennington Manual of Style enables teachers to download a comment bank of 438 Essay e-Comments into the Autocorrect function of Microsoft Word®. Then, teachers type in the assigned alphanumeric code and the entire formatted writing comment appears in a comment bubble where desired on the student’s essay. Teachers can save time, yet do a more thorough job of essay response. It’s simple to add in personalized comments. Developing writers often have problems writing in complete sentences. Fragmented speech, such as “Catch you later,” and text messaging, such as POS RU GO-N? help to perpetuate this problem. Additionally, students lack understanding of sentence structure, such as the roles of subjects and predicates, phrases, and clauses. I have three suggestions for teaching complete and coherent sentence writing. They work remarkably well, use only a bit of “explicit” grammatical instruction, and teach grammar in the context of oral language and writing. 2. Re-think whether the sentence states a complete thought. To teach recognition of sentence fragments, check out this article on Sentence Fragments. To teach recognition of run-on sentences, check out Run-on Sentences. 3. Read the sentence out loud to ensure that the voice drops down at the end of a declarative, imperative, or exclamatory (up for interrogative). This last one connects with students’ oral language abilities and is especially powerful for your grammatically-challenged kids. Of course, students can force their voices down or up and inaccurately apply this strategy, so encourage natural reading-the out loud part is crucial. The third suggestion is “tried and true” sentence combining. Of course, this necessitates teaching phrases and clauses, but my seventh graders catch on quickly with lots of modeled practice. I use lots of sentence revision activities as warm-ups to teach sentence combining. Teaching Essay Strategies includes 64 Sentence Revision activities to improve the quality, variety, and writing style of student sentences. 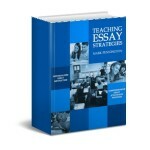 Find essay strategy worksheets, eight complete writing process essays (four argumentative and four informational/explanatory), writing fluencies, sentence revision activities, remedial writing lessons, and editing resources to differentiate essay writing instruction in Teaching Essay Strategies. Plus, get the comprehensive e-comments download in this fine program. English-language arts teachers do spend a lot of time getting students to identify and use subjects and predicates properly. These are the two major parts of the sentence. In fact, every complete sentence must have a subject and predicate. Today’s grammar and usage lesson is on subjects and predicates. Remember that every sentence must have a subject and predicate. It’s important to know how to identify subjects and predicates. Learning how to identify subjects and predicates will help students and employees comprehend sentences and avoid sentence fragments and run-ons in their writing. Knowing how to identify subjects and predicates will also allow students to manipulate sentences for greater sentence variety. For example, good writers strive to write 50% of their sentences without sentence subject openers. There are other ways to construct a sentence other than SUBJECT-PREDICATE-OBJECT. Now let’s read the grammar and usage lesson (Common Core Language Standard 1.0) and study the examples. The predicate does the work of the “do-er” of the sentence. The predicate shows a physical or mental action or it describes a state of being. The simple predicate is the verb that acts upon the subject of the sentence. The complete predicate includes additional words that modify the predicate. The compound predicate describes a predicate with two or more verbs. The simple subject is usually found at the start of a declarative sentence. To find the subject of the sentence, first identify any prepositional phrases and eliminate the nouns and pronouns found in these phrases from consideration. The subject of the sentence is not part of a prepositional phrase. Frequently, in imperative sentences, the simple subject, “you,” is implied (suggested, not stated). To find the predicate, first identify the subject and ask “What?” The answer to this question should be the predicate. The predicate usually follows the subject in a sentence. However, it can be placed before the subject in a question (Was it your mother’s purse? ), in an implied (suggested, not stated) sentence (Look out! ), or in a phrase or clause at the beginning of a sentence to add special emphasis (Even more interesting was the fact that she knew it would probably rain). Writing Application: Write your own sentence using a complete subject and a complete predicate. Learning how to fix sentence fragments is challenging to writers of all levels. Inexperienced writers may write in sentence fragments because they do not understand what constitutes a complete thought or because they model their writing after their fragmented speech. Experienced writers get habituated to “memo-style,” dialogue (text messaging), or point-by point writing and struggle writing connected thoughts. Here are a few workable strategies to revise these errors in sentence structure. But first, let’s begin with what constitutes a complete sentence. has both a subject and a predicate. has the voice drop down at the end of a statement and the voice go up at the end of a question (in English). Definition: A sentence fragment consists of an incomplete thought, a sentence subject, or a sentence predicate and so is an incomplete sentence. -Add on a subject (person, place, thing, or idea), i.e. the “do-er” to act on the verb in the sentence. Change the verb form to fit with the subject. -Add on a verb (physical or mental action or a state of being) to “do” the action of the “do-er,” i.e. the subject. Learning how to fix run-on sentences can be challenging for writers of all levels. From beginning writers who don’t have the conceptual grasp of a complete thought to more experience writers who get caught up in the mire of dependent clauses and phrases, here are a few workable strategies to revise these errors in sentence structure. Definition: A sentence run-on consists of two or more independent clauses connected together as if they were one sentence without the benefit of a conjunction or proper punctuation. An independent clause means that there is a subject and a connecting verb that express a complete thought. But first, let’s begin with what constitutes a complete sentence. 1. Separate the run-on into two or more sentences. Luis told his brother he told his sister, too. The Fix-Luis told his brother. He told his sister, too. 2. Add a semi-colon between the clauses. Mary let him have it, she knew what she was doing. The Fix-Mary let him have it; she knew what she was doing. 3. Add a comma, then a conjunction after the first independent clause. I like her, she doesn’t like me. The Fix-I like her, but she doesn’t like me. 4. Add a subordinating conjunction to one of the clauses. Max was injured, he was still the best. The Fix-Even though Max was injured, he was still the best. 5. Change the second clause to a phrase starting with an __ing word. They went to school, they looked for him. The Fix-They went to school, looking for him.